Mobil-Eyes Us is a project of WITNESS and the WITNESS Media Lab to explore potential new approaches to livestream storytelling for action. We look at technologies, tactics and storytelling strategies to use live video to connect viewers to frontline experiences of human rights issues they care about, so they become ‘distant witnesses’ who will take meaningful actions to support frontline activists. We have developed a series of storytelling experiments, in collaboration with favela-based human rights activists in Rio de Janeiro, which has lead to an app. This app, Mobil-Eyes Us (which is in its alpha stages), enables an activist group to curate a series of eyewitness Facebook live-streams and push these to the relevant people in their network to watch and take individual or collective action. They would be able to rapidly share a stream so more people are present and witness an incident, help translate, provide guidance or give context. In the following series, our Project Lead in Rio, Clara Medeiros, will share the practices learned from the live videos of 18 activists from Rio de Janeiro and collectives from favelas who have had an impact on their communities, both by denouncing human rights violations and by giving support to initiatives to and from the favelas. We hope to better understand the strategies and techniques that frontline activists used successfully from the analysis of these live streams, that encompass solidarity marches, planned actions, broadcasts documenting rights violations and call-outs. This text was originally published in Portuguese on WITNESS Português. 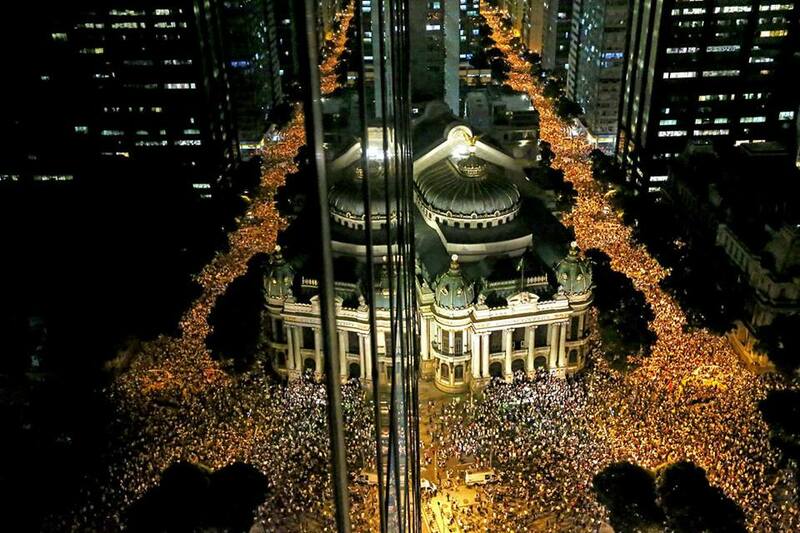 In September 2011, I was attentively following what was happening in New York during Occupy Wall Street from Rio de Janeiro via numerous live broadcasts. From that moment, I began to research this new media that became very popular on Brazilian streets and social networks during the demonstrations in June 2013. During these demonstrations in Rio, there were many situations were Brazilians’ rights were violated such as during the occupations and repossession suits. But in response, there was a boom of individuals using livestreams in order to guarantee these rights through the evidence recorded and shared in real time. And it was precisely because of this that I began to broadcast – to have the recorded live data of any possible police abuse saved online, avoiding any loss of evidence if the police took my recording equipment. After two broadcasts with just a few worried friends and family members watching as my audience, I joined the media collective Rio na Rua and format and structure of my streamings started becoming more professional. I further explored possible best uses for this tool as the collective improved its own organizational structure and its audience reach grew. As a result of my work with Rio na Rua, I was invited by WITNESS during the Rio 2016 Olympics to participate as a consultant in the Mobil-Eyes Us initiative. For the project, we would be testing how we could bring audiences and “distant witnesses” to engage with live broadcasts, where we would provide them with valuable context and timely translation, while also offering meaningful ways to take action. We looked for ways to enable a sense of shared presence and participation in the same space of the streamers rather than just becoming spectators as events unfold. You can check the live streams we made at Vila Autódromo, Penha and the Olympic Boulevard during the #FomeDeViver direct action in the first phase of the pilot. At the time, the app was in its conceptual stages, so we provided the translation and context, both directly in the comments box of the broadcasts and in location next to the activist leading the broadcast. We also tested a notification system via SMS, which would later be incorporated into the notifications within the app itself. We experimented with the idea of action tags – so instead of a #hashtag, we used an ^actiontag to provide a signal to distant witnesses and viewers of the actions that streamers wanted them to take. We would notify people to ^makevisible a broadcast when streamers needed their stories to reach a wider audience; to ^bepresent so people could make themselves present and carry out tasks such as ^translate and give ^context among other ways of getting more richly involved. We also created a hot site to gather together all relevant information about the streamings during the Rio Olympics Games in 2016. On that page, people could interact with the videos using Deepstream (a platform that doesn’t exist anymore) and we created an interactive timeline to contextualize key moments and facts that year. We used Crowdvoice as well in order to curate additional social media information about the social and human rights context of Rio 2016, such as video streamings from other sources. Since then, I have been monitoring and analyzing live videos produced by community communicators from Rio. Over 100 video streamings were studied during the process to learn more about the potential of live broadcasts as a tool for creating new and strengthening existing networks, while creating impact both on and offline. This analysis also generated a contextual report for each case that was shared to technology platforms like Facebook, highlighting what was being produced in Rio de Janeiro within the platforms, and what they could do better in terms of policy and product to support these and so many other grassroots activists. We will address this further in another future publication where WITNESS Program Director, Sam Gregory, will detail what we think tech platforms can do differently to support a more effective co-present live streaming. A key part of Mobil-Eyes Us is to have a collaborative network capable of curating a more complex narrative. During this process, we closely followed streamings from Coletivo Papo Reto in Complexo do Alemão (Northern Zone of Rio de Janeiro), providing context and translating pre-planned actions. This was the case of the call for tenders for the construction work on the area known as Favela da Skol, located inside Complexo do Alemão which we have been following since the Olympic Games in Rio, and emergency campaigns like that of Rio de Janeiro police invading homes in Samba Square (link to the article in Portuguese). From these cases, it was clear that there was an already existing support network among community activists from different territories of Rio de Janeiro. And since one of the objectives of the initiative is to strengthen the connections between those activists in the frontlines and those who can’t be present but want to show their solidarity, we began to closely monitor the exchange made between activists from collectives such as Fala Akari and Maré Vive. Stemming from this research, we also developed a broadcasting workshop that analyzes and discusses live streaming as a tool not only from the point of view of the creator who is interested in learning how to produce a live video, but also from the point of view of an active witness/spectator. It was structured around fostering a culture of support and exchange between frontline activists and all types of distant witnesses, those who can only engage with the action remotely, with the goal of understanding the needs, abilities and availabilities of each participant. We also considered how to take advantage of effective techniques and tips to enable participants to collaborate on impactful actions. In the next post we will detail the call-out strategies and techniques used successfully by frontline activists based on the experience from three live broadcasts. Stemming from this participatory framework, we will understand how to produce an impactful broadcast not only while live but also afterwards, enhancing shareability, reach and the impact of these actions. Follow us on Witness Brasil on Facebook (in Portuguese) for more.